Ever had an agent deny to show you a home because you weren’t pre-approved for a mortgage? It’s not because we don’t value you or your business, it’s actually were protecting you and positioning you for success. Let’s face it, buying your next home is emotional, there are big differences from different bracket priced homes. Add $50,000.00 to the purchase price usually means different neighborhoods, accommodations and features. Inevitably human nature wants to move up and get something nicer. This can become an issue if an individual does not qualify, everything else just doesn’t seem to measure up. Everything in real estate is about relationships and reputations. Its our opinion but we believe a valid one, who you work with is even more critical than the actual process. Does your agent have the reputation of closing? How about the lender you chose? Coming from a lending back ground and operating a real estate brokerage in 2 states I can tell you because of our reputation we have been able to secure offers for our clients that were thousands less because the listing agent knew it was going to close and was unsure about the other offers. Wow what a compliment! The basic premise is unlike a pre-qual which usually only considers partial facts over the phone. A pre-approval is a gathering of W2’s, tax returns, 1099’s, bank statements and credit. This places the facts in front of your skilled lender who then can be more accurate. Our goal is to protect your time, money and emotional wellbeing. 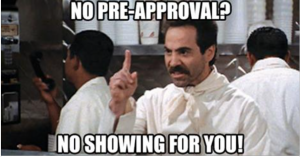 A pre-approval differs from a pre-qualification. It tells the presumptive seller you have done everything you need to do and prepared correctly to ensure them you are ready to go and will make their life as easy as possible. Your not taking this lightly nor should they view you or your offer that way. It also allows you to discover anything in your file you may or may not even be aware of and correct these items prior to losing that home you have worked so hard at securing. As mentioned above getting pre-approved before you begin house hunting allows you to know how much house you can realistically afford. Knowing this narrows down the options and makes the selection process more efficient. Not to mention, it protects you from the unpleasant surprise of realizing the home you fell in love with doesn’t fit your budget. 3. It strengthens to your offer. Lets face it, there are two questions are asked on every buyers offer. The 1st is by the listing agent. These 2 primary questions are, first will it close? And second will they drive me nuts in the process? The seller always has the same 2 question also, 1st will it close? 2nd is will I be able to secure top dollar out of this offer? Being prepared tells the seller you are minimizing the surprises that have the potential to come up in the escrow. The listing agent is your first hurtle and has some influence in the way he or she presents your offer to the seller so it is in your best interest to position yourself right the first time. We are empowered to negotiate better having all the facts, it also tells us what we can do or not do if the seller counters. It doesn’t indicate your desire rather if the seller counters too high or asks for a condition we now know will not align with the pre-approval we can answer this. This may not sound like a big deal, but being pre-pared with all the facts also is a negotiating tools. When we can efficiently and effectively answer questions it inspires confidence and builds trust with the other side. 5. It saves a lot of frustration. Obtaining a mortgage is no small task. It may feel like they want everything including your blood type. Without doing this the right way many, many surprises can pop up costing you delays, possibly thousands of dollars and even losing the home. Who you hire means the difference between enjoying this process or hating it. Make sure you trust your lender, they can be your greatest advocate or create many issues for you. Makes sense, too. Right? Think about it: when you hire an agent, they must protect their time, they’re running a business, if they cannot close they do not get paid, this is how we feed our families. Think about going to work tomorrow, this week or even next month with no guarantee you were going to get paid other than the results you produce. If your transaction does not close, they do not get paid, no business can survive this way. We invest countless hours showing you homes over the course of the transaction. If you were in their shoes, wouldn’t you want assurance that your hard work would lead to a favorable outcome for both you and your client? Now consider the listing agent and how he or she perceives the offer and pre-approval letter. This has an impact on how it is presented to the seller, this could make a huge difference based on how he or she feels about the outcome of your offer. We have trusted mortgage advisors that are skilled and have a track record, if you would like to explore your options please let us know. There is no obligation.